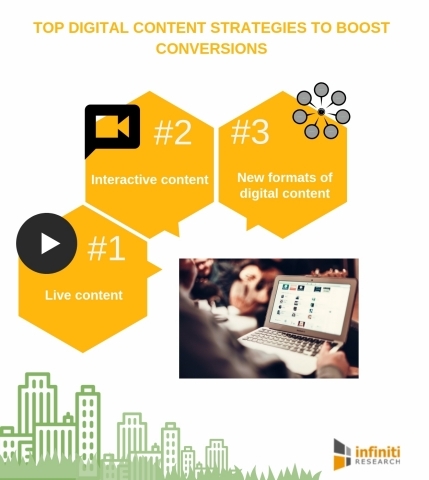 Infiniti Research Reveals the Top Three Digital Content Strategies That Will Help Boost Conversions - Request a Free Proposal Today! LONDON--(BUSINESS WIRE)--Infiniti Research, a world-renowned market intelligence solutions provider, has announced the completion of their latest article on the top digital content strategies that will help boost conversions. Digital marketing is an ever-changing field and needs an innovative, up-to-date, and strong digital content strategy to ensure conversions. Latest technological innovations such as Amazon Echo, hands-free voice search via Google Home, video content, social media, and the use of AI has a huge impact on the digital content strategy devised by any brand or company. As a result, businesses need to keep pace with the changes to harness these opportunities to outshine their competitors. “The way people consume content has changed briskly over the last few years. So, companies need to change their digital content strategies accordingly to meet the evolving consumer demands,” says a digital marketing expert from Infiniti Research. Choosing the right digital marketing plan that meets your every requirement is a tumultuous task for companies. We at Infiniti Research, understand this conundrum and have made a name for ourselves when it comes to offering customized strategies to devise effective and successful digital content strategies. Request a free proposal today! The scope of video content has increased significantly and has a huge organic reach compared to other types of posts on social media. Moreover, going live on any social media platform increases the engagement up to 10 times when compared to other posts shared on the same platform. This shift has compelled companies to invest in digital strategies and gauge the wider market to capitalize on the potential opportunities. To know how we’ve helped the companies in planning out their digital content strategies, get in touch with our experts. Companies nowadays have started investing heavily in virtual reality to make the most of the available opportunities. However, the use of such a digital content strategy along with virtual reality will be a bit costly for consumers. Despite the cost, many brands are expected to capitalize on such digital content strategies to gain an edge over their peers. To know about the impact of digital content strategies in marketing the products and services of the company, consult with our industry experts. With the changing landscape of the internet, new strategies and digital platforms have come into existence. Writers are now working with graphic designers, video creators, social media gurus, and community managers to try out new formats of digital content strategy. The companies are also changing their strategies and inculcating new strategies like hosting, videos, eBooks, infographics, webinars, and podcasts to stay in line with consumers’ demands. Request a free proposal to know more about the pricing strategies involved in developing digital content strategies for businesses. Infiniti Research has announced the completion of their latest article on the top digital content strategies that will help boost conversions.